The Higher Education Management Information Section was established in 2013 The purpose of the Cell was to automate all the manual process and business of the Department for high information among sections/offices of the Department and hence for timely decision making by the Administration. To bring excellence in education by incorporating state of the art technologies for automating functions of the Department at all levels. Assembles, process, stores, Retrieves, evaluates and disseminates information of Higher Education for decision making and customize reports generation. Enable administration to timely take decision by providing up to date information. Minimizes information overload by changing larger amount of data into summarized form. Bring Coordination by integrating specialized activities among offices/sections. To enable Department to report information of HR and Colleges for day to day activities like Transfer, Posting, Promotion employing staff, admission, budgets, Planning etc. To support all technology and computer related activities in the Department. MIS Module which stores information regarding Staff and College across the province. Different sections/offices generate reports as per their requirements. Website of Higher Education Department is live. Online Admission System is developed and successfully implemented in district Peshawar and all the JMC’s Colleges throughout the Province for the Intermediate admission (2016-17). Similarly web portal for all colleges is also completed. File Paper tracking System is completed. Collection the data from concern offices to maintain in the Departmental Monitoring System which is observed by the office of Chief secretary Khyber Pakhtunkhwa. 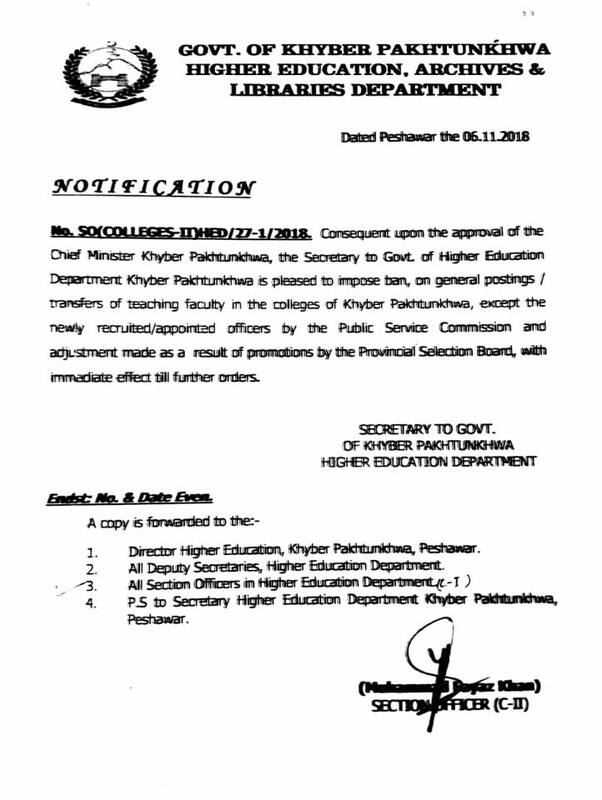 Monitoring of Colleges was initiated under the special direction of Mr. Mushtaq Ghani Special Assistant to Chief Minister, Khyber Pakhtunkhwa for higher Education Department in order to streamline the overall business of Colleges working under higher education Department. At present 4 Monitoring Officer and 10 Data Collector are haired to point out the deficiency / shortcoming in Government College of Khyber Pakhtunkhwa. Project has been initiated to install Bio-metric devices in the all Government colleges of Khyber Pakhutnkhwa. Purchase of Hardware and equipment’s for the Cell.